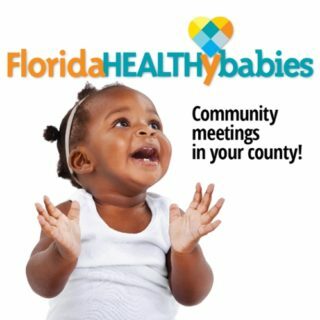 On June 14 and June 21, staff of the Florida Department of Health in Sarasota County (DOH-Sarasota) will host community meetings with families to discuss the Florida Healthy Babies program, a “statewide initiative designed to positively affect social and economic factors that influence health and reduce racial disparities in infant health,” the department has announced. The session on Tuesday, June 14, will be held from 5:30 to 7:30 p.m. at the Hyatt Regency, located at 1000 Boulevard of the Arts in Sarasota. The South County meeting will take place on Tuesday, June 21, from 5:30 to 7:30 p.m. at the Heron Creek Golf & Country Club, located at 3401 S. Sumter Boulevard in North Port, a news release notes. Registration is required, the release points out. Interested persons may call 861-2779 or email Pascale.Edouard@FLHealth.gov. “We want every child to have a healthy start in life so they can reach their full potential and enjoy a good quality of life,” said DOH-Sarasota Health Officer Chuck Henry in the release. “This means working as a community to remove barriers preventing pregnant women from getting early and continuous prenatal care, and helping connect families to education and community resources promoting breastfeeding, safe sleep, child safety and infant care,” he added in the release. Recently, the Florida Department of Health invested $1.4 million in the Florida Healthy Babies initiative, the release explains. Some funding was provided to all 67 counties to enable them to “conduct an enhanced data analysis of infant mortality and to host community-action planning meetings to address disparities in infant mortality,” the release says.